سلطانی, حسین, طاووسی, مجید. (1397). مقایسه‌ی رفتار خوردگی پوشش‌های کامپوزیتی Fe-Ni-Cr تقویت شده توسط نانوذرات کاربید سیلیسیم و نانولوله‌های کربنی. علوم و فناوری کامپوزیت, 5(3), 369-376. حسین سلطانی; مجید طاووسی. "مقایسه‌ی رفتار خوردگی پوشش‌های کامپوزیتی Fe-Ni-Cr تقویت شده توسط نانوذرات کاربید سیلیسیم و نانولوله‌های کربنی". علوم و فناوری کامپوزیت, 5, 3, 1397, 369-376. سلطانی, حسین, طاووسی, مجید. (1397). 'مقایسه‌ی رفتار خوردگی پوشش‌های کامپوزیتی Fe-Ni-Cr تقویت شده توسط نانوذرات کاربید سیلیسیم و نانولوله‌های کربنی', علوم و فناوری کامپوزیت, 5(3), pp. 369-376. سلطانی, حسین, طاووسی, مجید. مقایسه‌ی رفتار خوردگی پوشش‌های کامپوزیتی Fe-Ni-Cr تقویت شده توسط نانوذرات کاربید سیلیسیم و نانولوله‌های کربنی. علوم و فناوری کامپوزیت, 1397; 5(3): 369-376. هدف از این پژوهش بررسی رفتار خوردگی پوشش‌های کامپوزیتی Fe-Ni-Cr تقویت شده توسط نانوذرات کاربید سیلیسیم و نانولوله‌های کربنی می‌باشد. در این راستا و به منظور ایجاد پوشش‌های مورد نظر، فرایند رسوب‌دهی الکتریکی در یک حمام کلریدی، در حضور و عدم حضور تقویت کننده‌های کاربید سیلیسیم و نانولوله‌های کربنی انجام شد. بررسی‌های‌ ریزساختاری توسط پراش‌سنجی پرتوایکس (XRD) و میکروسکپ‌ الکترونی روبشی گسیل میدانی (FESEM) و بررسی رفتار خوردگی به روش آنالیز پتانسیو استات در الکترولیت NaCl %5/3 انجام شد. نتایج نشان داد که پوشش آمورف- نانوکریستال Fe-Ni-Cr در چگالی جریان‌های کم به علت وجود ریزترک کمتر دارای بهترین رفتار خوردگی است. بررسی رفتار خوردگی پس از عملیات حرارتی (در دمای 250 درجه‌ی سانتی‌گراد به مدت 10 ساعت) نیز نشان داد که با انجام تبلور فاز آمورف در پوشش، مقاومت خوردگی بهبود می‌یابد. رفتار خوردگی با کامپوزیتی کردن پوشش‌های بهبود یافت به گونه‌ای که بالاترین مقاومت خوردگی در حضور نانوذرات تقویت کننده‌ی کاربید سیلیسیم در پوشش به دست آمد. In this study, the corrosion behavior of Fe-Ni-Cr composite coatings reinforced by SiC and carbon nanotube (CNT) has been investigated. In this regards, the electrodeposion processing has been done in a chloride bath in the presence of SiC nanoparticles and carbon nanotubes. The prepared coatings were characterized using X-ray diffraction (XRD) and field emission scanning electron microscopy (FESEM). The corrosion behavior of coatings was also examined in NaCl 3.5% electrolyte by potentiostat analysis. The results showed that, the prepared amorphous - nanocrystalline Fe-Ni-Cr coating in lower current densities has higher corrosion behavior due to lower density of micro-cracks in coat. The annealing process and the crystallization of amorphous phase (at 250oC for 10 h) had the positive effects on corrosion resistance of prepared coats. The corrosion resistance of composite coatings was higher than alloyed coatings. In this condition, the highest corrosion resistance was achieved in the presence of SiC nanoparticle in the coats. Kang, J.C. and Lalvani, S.B. “Electrodeposition and Characterization of Amorphous Fe-Ni-Cr-based Alloys” Journal of applied electrochemistry, Vol. 25, pp.376-383, 1995. 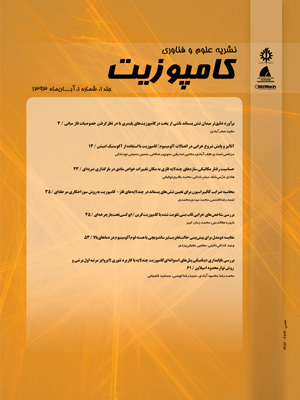 Esrafil, B., “Metal Electroplating Engineering, Tarrah Publishing, Tehran, pp. 74-79, 2000. (In persian). Brenner, A., “Electrodeposition of Alloy, National Bureau of Standards, Washington 1996. Kim, S.K. and Yoo, H., “Formation of Bilayer Ni-SiC Composite Coatings by Electrodeposition, Surface and Coating Technology”, Vol. 275, Pp.564-569, 1998. Gajalakshmi, S. and Snram, K., “Investigation of Mechanical Behavior of Ultra-Light Weight Nano Composite for Aero-Craft”, International Journal of Science and Research, Vol. 4, pp. 1892-1895, 2015. Shi, L., Sun, C., Gao, P., Zhou, F., Liu, W., “Mechanical Properties And Wear and Corrosion Resistance of Electro Deposited Ni-Co/SiC Nanocomposite Coating”, Journal Applied Surface Science, Vol. 252, pp. 3591-3599, 2006. Shi, X.L., Yang, H., Shao, G.Q., Duan, X.L., Yan, L., Xiong, Z. and Sun, P., “Fabrication and Properties of W-Cu Alloy Reinforced By Multi-Walled Carbon Nanotubes”, Materials Science and Engineering, Vol. 457, Pp.18-23, 2007. El-Sharif, M., Wang, X., Chisholm, C.U., and Watson, A., “Effect of Heat Treatment on Microstructure of Cr-Ni-Fe Coating Prepared by Electrodeposition”, Material Science, Vol. 163, pp. 633-640, 1994. Sziraki, L., Kuamann, E., El-Sharif, M., and Chisholm, C.U., “Electrochemical Behavior of Electrodeposited Strongly Disordered Fe-Ni-Cr Alloys”, Electrochemistry Communication, Vol. 2, pp. 619-625, 2000. Alberto, C., Carlos, A. and Bidoia, E.D., “Electrodeposition of Amorphous Fe-Cr-P-Ni-C Alloys Morphological And Structural Characteristics”, Journal of Metastable and Nanocrystalline Materials, Vol.14, pp.39-44, 2002. Dolati, A., Ghorbani, M. and Afshar, A., “The Electrodeposition of Quaternary Fe-Cr-Ni-Mo Alloys from the Chloride-Complexing Agents Electrolyte Part I. Processing”, Surface and Coatings Technology, Vol.166, pp.105-110, 2003. Souza, C.A., May, J.E., A.T., Machado, A.L., Tachard, and Bidoia, E.D., “Preparation of Fe-Cr-P-Co Amorphous Alloys by Electrodeposition”, Surface and Coatings Technology, Vol. 215, pp. 75-82, 2005. Xiang-Zhu, H., Chang-Bin, X. And Hong-Jun, W., “Electroplating Process of Amorphous Fe-Ni-Cr Alloy”, Transaction of Nonferrous Metals Society of Chaina, Vol.11, pp. 956-959, 2001. Adelkhani, H. And Arshadi, M., “Properties of Fe-Ni-Cr Alloy Coatings by Using Direct and Pulse Current Electrodeposition”, Journal of Alloys and Compounds, Vol. 476, pp. 234-237, 2009. Huang, C.A., Chanh, J., Chen, C., Liao, K. and Mayer, J., “Microstructure and Electrochemical Corrosion Behaviar of Cr-Ni-Fe Alloy Deposits Electroplated in the Presence of Trivalent Cr Ions”, Thin Solid Films, Vol. 544, pp. 69-7318, 2013. Kanagaraj, R., Kannan, R., and Ganesan, S., “Synthesis and Characterisation of Electrodeposited Ni-Fe-Cr Thin Films”, Journal of Ovonic Research, Vol. 6, pp. 197-204, 2014. Cullity, B.D., “Element of X-Ray diffraction”, 2rd edition, Addison Wesley, Massachusetts, pp. 45-85, 1978. Miedema, A.R., Deboer, F.R., And Boom, R., “Model Predictions for The Enthalpy of Formation of Transition Metal Alloys”, Vol. 1, Pp. 341-359, 1997. Naka, M., Hashimoto, K., and Masumoto, T., “High Corrosion Resistance of Chromium-Bearing Amorphous Iron Alloys In Neutral And Acidic Solutions Containing Chloride”, Corrosion, Vol. 32, pp. 146-152, 1976. Mcbee, C.L., Kruger, J., “Nature of Passive Films on Iron-Chromium Alloys”, Electrochimica Acta, Vol. 17, pp.1337-1341, 1972. Kawashima, A., Hashimoto, K., and Masumoto, T., “Stress Corrosion Cracking of Amorphous Iron Base Alloys”, Corrosion Science, Vol. 16, pp. 937-943, 1976. Vaezi, M.R., Sadrnezhaad, S.K., Nikzad, L., “Electrodeposition of Ni-Sic Nano-Composite Coatings and Evaluation of Wear and Corrosion Resistance and Electroplating Characteristics”, Colloid and Surfaces, Vol. 315, pp.176-182, 2008.